"'Just sayin” could get you buried real quick." Yesterday brought our first look at a balding Johnny Depp as he takes on the role of real life crime boss Whitey Bulger in the new crime drama Black Mass from Crazy Heart director Scott Cooper. And today brings the first intense trailer for the film that looks like it actually features an interesting performance from Depp. Somehow, the actor looks more creepy balding and with blue eyes than he has as any of his other cooky characters. The trailer prominently features a tense dinner scene, and it gives off a vibe that this performance from Depp could be an awards contender. Watch! 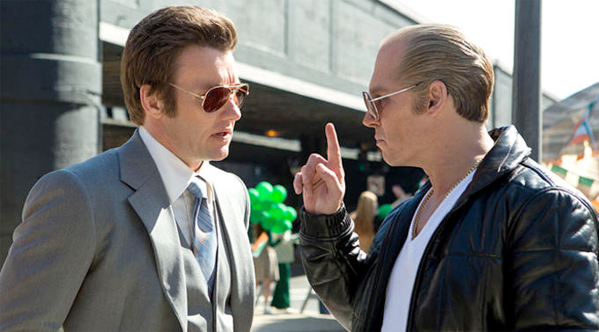 You can still see the first look photo from Black Mass right here. Black Mass is directed by Scott Cooper (Out of the Furnace, Crazy Heart) and written by Jez Butterworth (Edge of Tomorrow, Get on Up) and newcomer Mark Mallouk. In 1970s South Boston, FBI Agent John Connolly (Joel Edgerton) persuades Irish mobster James “Whitey” Bulger (Johnny Depp) to collaborate with the FBI and eliminate a common enemy: the Italian mob. The drama tells the true story of this unholy alliance, which spiraled out of control, allowing Whitey to evade law enforcement, consolidate power, and become one of the most ruthless and powerful gangsters in Boston history. Benedict Cumberbatch, Adam Scott and more star in the film Warner Bros. Pictures releases this fall September 18th. Interested? Looks incredible, and the cast, oh yeah...let me get some tissues. He is a freaking chameleon!!! love it, this gots the goodfellas, scarface and some of departed vibe int....gangster movies are one of my top genres! Awesome! Added to the most anticipated list. Great cast! Daaaamn, I got chills with that. Depp looks creepy as hell and acted it as well. Not familiar with the story but I'm feeling it. As a former Bostonian, I am all over this movie. It looks wicked awesome! Wicked is right! All hail Whitey! Well that was just a rumor for sure!! Ripped a bit from the "funny how?" scene from GoodFellas, but Depp looks really strong as Whitey and the rest looks pretty good too...my interest in this movie just went up a whole lot. Not really. Pesci's character in GF was dangerous but in that scene he was just kidding around... while in this trailer there is no joke. Depp's character means what he says - Even if he laughs it off in the end, the threat is real. Depp looks like a white walker. I really struggle to enjoy Depp anymore, also felt like the Goodfellas scene... Will give it a shot though. How do you struggle to enjoy him when he's that good.. ? Disagree. They dont look fake to me. I actually agree with you. they look flawless. But will they say, "Rico Case"? This looks great. Great to see Depp when he's not working with Burton. He looks incredible in this. Damn. That looks gosh darn swell. The pictures aren't as gay as your statement is retarded. Oh my, that looked great. Also felt like a quick reminder that despite his recent poor roles, Johnny Depp does have the acting-chops. Holy crap. I love it. Feels like something from Scorcese. Seems like a great film. Just sayin'. Did they just rip the Joe Pesci GoodFellas scene? YEP!! I thought the same thing!! This is gonna flop for sure, they should have used a different actor, maybe Clooney, or even Pesci himself, Depp looks like a clown in this get-up!! And to think, Mr. Depp's most convincing performance yet is just him, only fatter, balding, and with blue eyes. *Shivers*. Looks like another incredible performance from Depp.